Round robin DNS is nothing but a simple technique of load balancing various Internet services such as Web server, e-mail server by creating multiple DNS A records with the same name. Half of the time when a user make foo.dnsknowledge.com request will go to 202.54.1.2 and rest will go to 202.54.1.3. In other words, all clients would receive service from two different server, thus distributing the overall load among servers. Next request would go to the server 74.125.67.100. By using Round Robin DNS google managed to lighten the webserver load. This kind of setup pretty common among the large website such as google.com, amazon.com, yahoo.com etc. If your site gets a large number of hits (millions of unique hits per day) per day, consider using this technique. How do I fix this problem under BIND 9 named server? Time to live (TTL) is used for computer data including DNS servers. It is nothing but time on the period of time or number of iterations or transmissions in computer and computer network technology that a unit of data (e.g. a packet) can experience before it should be discarded. A NXDOMAIN is Non-Existent Domain. It is a term used for the Internet domain name that is unable to be resolved using the DNS servers or domain name not yet registered. NXDOMAIN can also take place due to the network or DNS server problem. A TLD (top-level domain) is the highest level of domain names in the root zone of the DNS of the Internet. For all domains in lower levels, it is the last part of the domain name, that is, the label that follows the last dot of a fully qualified domain name. In other words the last part of an Internet domain name that follow the final dot of a fully qualified domain name. For example, in the domain name www.dnsknowledge.com, the top-level domain is com. The DNS is the default name resolution service used in UNIX (configurable option) and Windows servers. However, when the Internet was very small, hostname resolution was done using /etc/hosts file under UNIX. The hosts file is a computer file used by an operating system to map hostnames to IP addresses. MS-Windows also support the hosts file and usaully locate at %SystemRoot%\system32\drivers\etc\ directory. However, these days Domain Name System is the default name resolution service used in all operating systems including mobile phones such as Apple iPhone. DNS is part of the operating system and all TCP/IP network connections are, by default, configured with the IP address of at least two DNS server to perform name resolution on the network. In this tutorial, we’ll take a look at the DNS system. DNS is used to map a domain name to an IP address. For e.g. when you type a domain such as dnsknowledge.com into your browser the client needs to find the IP address where this website is located. This is done using DNS servers. However, keep in mind that over last few years the Internet grew into the tens of thousands (there may be billions of IP address active with hostnames), a more flexible more scalable solution was required. The DNS makes is possible to manage millions of hostnames and IP address efficiently. The DNS has become the main name resolution used on the Internet today. There have been various implementation of DNS over the years. UNIX systems typically use BIND (Berkeley Internet Name Domain) or djbdns. Microsoft Windows Server operating systems typically use a non-Active Directory, or standard, Domain Name System solution. However, various implemntations use the same protocols for exchanging DNS information over the Internet. You type a domain name such as google.com into your browser using client computer operating system such as Windows or Apple OS (“client”). The client needs to find the IP address where google.com search engine is located on the earth (typically all websites are hosted in the Internet data center). Your browser will send this query to the operating system. Each operating system is configured to query certain dns servers. 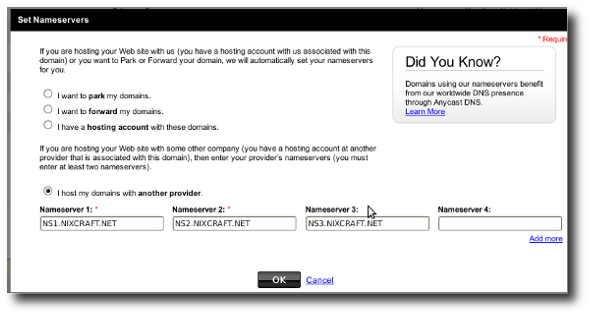 Typically your ISP or network administrator configures such dns servers called Resolving Name Server. The resolving name server does not aware of the location of the google.com, but it does know where the root servers are located. Next, the resolving name server find the location of the top-level domain name server to send query for google.com. Each domain on the Internet has authoritative name server. Finally, the authoritative name server will give you exact IP address of google.com. This information will come back to to the resolving name server, which caches the information and send backs an answer (answer to your query what is IP address of google.com) to the browser to the correct place. The end result you will see google search engine home page.
.			3600000	IN	NS	G.ROOT-SERVERS.NET.
.			3600000	IN	NS	F.ROOT-SERVERS.NET.
.			3600000	IN	NS	J.ROOT-SERVERS.NET.
.			3600000	IN	NS	I.ROOT-SERVERS.NET.
.			3600000	IN	NS	E.ROOT-SERVERS.NET.
.			3600000	IN	NS	D.ROOT-SERVERS.NET.
.			3600000	IN	NS	M.ROOT-SERVERS.NET.
.			3600000	IN	NS	H.ROOT-SERVERS.NET.
.			3600000	IN	NS	B.ROOT-SERVERS.NET.
.			3600000	IN	NS	C.ROOT-SERVERS.NET.
.			3600000	IN	NS	A.ROOT-SERVERS.NET.
.			3600000	IN	NS	L.ROOT-SERVERS.NET.
.			3600000	IN	NS	K.ROOT-SERVERS.NET. 4.2.2.1 is resolving name server. 4.2.2.1 queries root servers such as G.ROOT-SERVERS.NET. and others as it doesn’t aware of google.com’s IP address. G.ROOT-SERVERS.NET (one of root server) queries top level domain name server (.com server) to find out authoritative name server for google.com using L.GTLD-SERVERS.NET. L.GTLD-SERVERS.NET points back to ns3.google.com (one of name server of domain google.com) and its IP address. 4.2.2.1 caches result and returns actual IP address of google.com i.e. 74.125.67.100 to operating system. The DNS is a naming system for computers, servers and other network devices over the Internet. It is used for resolving hostnames to IP addresses or vice versa. For e.g. hostname server.dnsknowledge.com has IPv4 address 67.228.49.226 and has IPv6 address 2607:f0d0:1002:11::9. In other words DNS is used for associating a domain name (such as dnsknowledge.com) to an IP address (such as 67.228.49.226). It just work like the “phone book” for the Internet by translating easy remember computer or server names into IP addresses. Internet domain names are easier to remember than IP addresses such as 67.228.49.226 (IPv4) or 2607:f0d0:1002:11::9 (IPv6). Using DNS one can remember URLs such as google.com and e-mail addresses without having to know how the machine will actually locate them. The DNS client (also resolver). Each packet that is sent across an IP network over LAN or the Internet must contain a destination IP address. However, users prefer to identify destination hosts by hostname rather than IP addresses. Numerical IP addresses are difficult to remember. Almost, all applications such as web browser, e-mail client and other apps allow users to enter destinations as hostname. Your applications will automatically translate those hostnames to IP addresses using resolver library functions for communication. DNS makes it easy to remember network names, server names, file server names, web site names and e-mail address for network users. DNS is created for us to translate human-friendly computer names into IP addresses. DNS is critical for the Internet. DNS is an essential component of the functionality of the internet including e-mail, anti-spam, distributing software updates and much more. BELL Canada a consumer ISPs have started the practice of DNS hijacking on non-existent domain names, for the purpose of making money by displaying advertisements. This practice violates the RFC standard for DNS (NXDOMAIN) responses, and can potentially open users to cross-site scripting attacks. This is confirmed by several members of broadband web forum.